A diverse, distinguished group of democracy experts and civil society practitioners from both donor and recipient countries analyze civil society aid in five regions, including country case studies of South Africa, the Philippines, Peru, Egypt, and Romania. In recent years the United States and many other international donors have embraced civil society aid as a key tool of democracy promotion. They support thousands of NGOs around the world in the name of civil society development, investing in these organizations high hopes for fostering democratic participation and values. 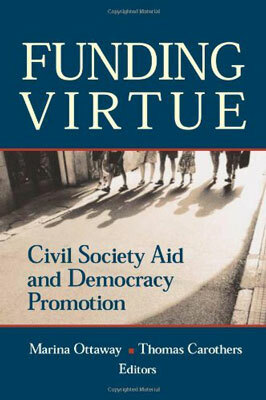 Funding Virtue: Civil Society Aid and Democracy Promotion critically examines this burgeoning field. A diverse, distinguished collection of democracy experts and civil society practitioners from both donor and recipient countries analyze civil society aid in five regions, including country case studies of South Africa, the Philippines, Peru, Egypt, and Romania. The authors focus on crucial issues and dilemmas, such as the relationship between donor conceptions of civil society and local realities, the effects of civil society programs, and how aid can be improved. The book's broad geographic reach, practical focus, and analytic rigor make it an invaluable guide to this vital new area of international affairs. Contributors: Mustapha Kamel Al-Sayyid, Cairo University, Egypt; Carlos Basombrio, Instituto de Defensa Legal, Peru; Imco Brouwer, European University Institute; Thomas Carothers, Carnegie Endowment; Stephen Golub, Open Society Institute; Chris Landsberg, Centre for Policy Studies, South Africa; Marina Ottaway, Carnegie Endowment; Dan Petrescu, World Bank, Romania; Kevin Quigley, Global Alliance, International Youth Foundation; Mary Racelis, University of the Philippines; Michael Shifter, Inter-American Dialogue. Marina Ottoway, co-editor, is a senior associate at the Carnegie Endowment for International Peace. A leading scholar of African politics, she has written extensively on political change and international aid in developing countries, including her book Africa's New Leaders: Democracy or State Reconstruction? (Carnegie Endowment, 1999). Thomas Carothers, co-editor, is vice president for studies and director of the Democracy and Rule of Law Project at the Carnegie Endowment for International Peace. A leading specialist in democracy promotion, he has published numerous books on democracy aid, including Aiding Democracy Abroad: The Learning Curve (Carnegie Endowment, 1999). "...well-written, very insightful, and filled with good information. An indispensable contribution for scholars and activists. Graduate and research collections."